The last few months – be it via the UK’s Brexit vote, in US presidential campaigning or the Hungarian government’s demonising of refugees – have all made clear how badly our societies communicate their politics. We don’t hear, let alone understand what other people are trying to say and they, in turn, are deaf to us and our ideas. The result is mutual incomprehension, mistrust and all the dangers of both. It’s hardly surprising so many people withdraw from political talk, or blank out politics completely. This is a huge mistake, albeit an understandable one. I am busy imagining a political project to campaign for radically better government systems supported by positive, or constructive, journalism. It is wildly ambitious but then it has to be with stakes so high – not least in terms of rampant social exclusion and the urgent need for radical climate-change action. The project whole will be an evolution of conclusions I drew in Fraudcast News – recast as calls to action. It will make the case for innovations requiring root-and-branch transformations to conventional politics. One would be to replace elected politicians as our main decision makers with juries of randomly selected groups of citizens. More of that in posts to come – today’s concern is communication. To transform our politics – we need radically better ways of talking and listening to one another. Efforts to communicate better will be a guiding principle for both the project’s creation and its realisation. That’s where the bald dude in the brown robes comes in – an extraordinary man called Thich Nhat Hanh. This Zen Buddhist Master has much to say about communication in his lifetime’s work in “Engaged Buddhism”. He coined the term in the 1950s, a time when his native Vietnamese stood confused and divided between Communism in the North and Capitalism in the South. Nhat Hanh described Engaged Buddhism at length in 2008, during a rare return from exile to visit Hanoi and elsewhere. A major element concerns communication. “When people cannot communicate they don’t understand each other or see the other’s suffering and there is no love, no happiness. War and terrorism are also born from wrong perceptions. Terrorists think that the other side is trying to destroy them as a religion, as a way of life, as a nation. If we believe that the other person is trying to kill us then we will seek ways to kill the other person first in order not to be killed. Fear, misunderstanding, and wrong perceptions are the foundation of all these violent acts. The war in Iraq, which is called anti-terrorist, has not helped to reduce the number of terrorists. In fact the number of terrorists is increasing all the time because of the war. In order to remove terrorism you have to remove wrong perceptions. We know very well that airplanes, guns, and bombs cannot remove wrong perceptions. Only loving speech and compassionate listening can help people correct wrong perceptions. I have been hugely lucky to come across Nhat Hanh’s teachings over the last few years at his French monastery and in broadcast talks online. He has profoundly influenced the ways I consider both politics and journalism – very much for the better, I think. Combining talk of politics and religion may not seem the smartest thing to do right now, not least in France, where I live. Yet I do it deliberately. Furthermore, Nhat Hanh explains in a recent book The Mindfulness Survival Kit that jiao, the Chinese and Vietnamese word for religion, means a tradition of teachings. In Eastern cultures, religion does not imply belief in God. So why take a monk’s advice on politics? 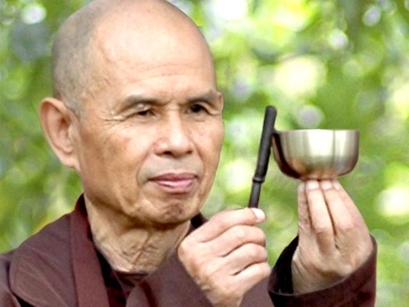 Thich Nhat Hanh is no ordinary monk.